Thursday, August 10, 2017 by Isabelle Z. Parents want to give their children the best start in life, but modern moms and dads are quite busy and often look for shortcuts. There are plenty of products on the market that cater to time-pressed parents, and while they might make life easier on the adults, some of these choices could set children up for a lifetime of health problems. Take the case of Oscar Mayer’s Lunchables, those overpriced boxed lunches sold in supermarkets. Are they convenient? Absolutely. Are they healthy? The short answer is no, but parents wouldn’t be blamed for thinking otherwise, given the lengths the company goes to to hide these foods’ ingredients from the public. A visit to the Lunchables Parents website created by Oscar Mayer parent company Kraft is an exercise in futility if you’re looking for the ingredients of these foods. Clicking on the name of one of the Lunchable varieties gets you nothing more than a punchy sentence or two that tells you which toxic meats and other fixings are included, and why eating it will somehow be fun for your little ones. Underneath is a tiny section called “Nutritional Highlights” that is aimed at making parents feel like they are somehow doing right by their children. It might as well say “Excellent source of carcinogens” given the ingredient list, for which it was necessary to consult a photo of the product on a grocery store website because it is either extremely well-hidden or entirely absent from the Lunchables Parents’ website. One of the most concerning ingredients is sodium nitrite, a common rust inhibitor chemical that the USDA is developing into a deadly bait for wild hogs to control their population. This known carcinogen can raise a person’s pancreatic cancer risk by a sobering 67 percent. In addition, nitrites turn into nitrosamines during digestion, which are the same chemicals that the pharmaceutical industry uses to give lab rats cancer so that they can test cancer treatments on them. This ingredient is the main reason that processed meat has been declared unsafe for human consumption by cancer experts. It also contains BHA and BHT, two preservatives that are carcinogens and have also been linked to hyperactivity, asthma, allergic reactions and birth defects. They are toxic to the liver and kidneys, and BHT has been banned in the U.K. because it is so dangerous. Most of the Lunchables offerings contain meat, although the term can only be used loosely when talking about what is inside these famous yellow boxes. 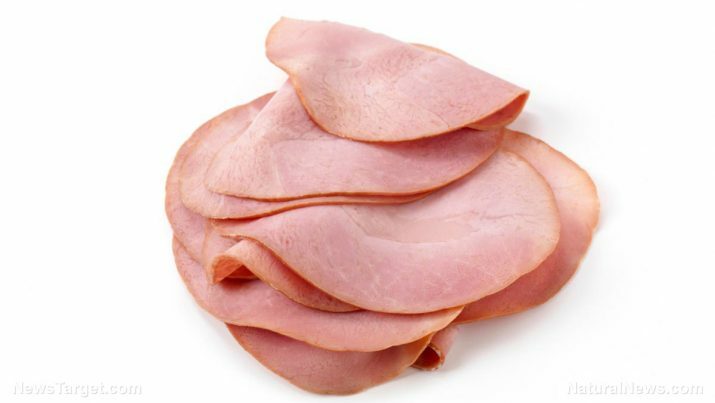 The ham is chopped, formed and then pumped with preservatives and water, while the turkey also contains modified corn starch, carrageenan, sodium nitrate and other concerning ingredients. The varieties that come with drinks or desserts also contain high fructose corn syrup, along with artificial colors and flavors. Moreover, Michael F. Jacobson points out in the Huffington Post that Lunchables contain an extraordinary amount of sodium. For example, the Ham + Swiss with Crackers variety has 1,130 milligrams of sodium, which is just 70 milligrams shy of the recommended 1,200 milligrams of sodium the typical elementary school-aged kid should not exceed in a day. Even those who skip the meat are not doing themselves any favors. The concoctions they try to pass off as pizza crusts and crackers in Lunchables are mostly made of white refined flour with all manner of partially hydrogenated oils, sugars, colorings, flavorings and preservatives. After knowing what these abominations that are being passed off as food really contain, how could any sane parent actually buy these Frankenfood boxed meals for their kids? That’s probably why the official Lunchables website isn’t too forthcoming about these ingredients. Preparing a healthy lunch for your kids doesn’t take that much longer than tossing a box in their lunch bag, and it’s an effort that will pay for itself time and time again in terms of good health.